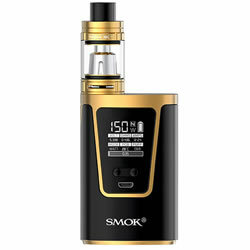 SMOK G150 Black-Champagne Gold FULL kit buy from NUCIG UK. Very good looking kit, with a real quality weight and feel to it. I like the fact that it is small enough and ergonomic - feels really good in the hand. The smog produced is outrageously good ! Recommend to all looking for a top end kit. This kit is my new fab favourite. Feels just right in the hand and by heck does it produce stupendous vapour.